Pegy speaks a few words. Neil starts his set with Dylan’s classic. 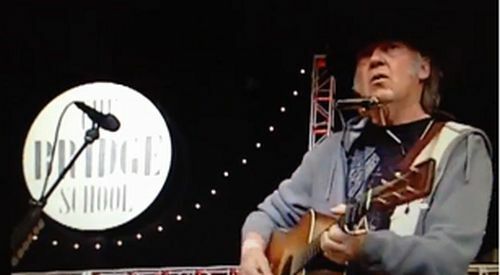 The 27 annual Bridge School Benefit will be streaming live! The 2013 Bridge School Benefit concert is scheduled for Saturday, Oct. 26 and 27 at the Shoreline Amphitheatre in Mountainview, Calif.
Watch at Youtube.com/bridgebenefitconcert or www.bridgeschoolbenefit.org. The 8-hour concert starts at 8 p.m. Eastern Time, 7 p.m. Central Time, and 5 p.m. Pacific Time. Also, recently added to the all acoustic musical performance line-up: Arcade Fire. Performing: Jack Johnson, Crosby, Stills, Nash and Young, Queens of the Stone Age, My Morning Jacket, Elvis Costello, Fun., Diana Krall, Heart, Jenny Lewis and Tom Waits. 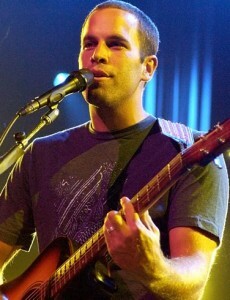 Singer Jack Johnson has been added to the 2013 Bridge School Benefit line-up. Jambands.com is reporting that Johnson will join Crosby, Stills, Nash and Young, Queens of the Stone Age, My Morning Jacket, Elvis Costello, Fun., Diana Krall, Heart and Jenny Lewis for the event, which is set to take place October 26 and 27 at the Shoreline Amphitheatre in Mountain Views, CA. Johnson has been added to the bill following The Killers’ recent cancellation. The Killers have announced they will not be performing at the 2013 Bridge School Benefit, scheduled for Oct. 26 and 27 at the Shoreline Amphitheatre in Mountainview, Calif. The line-up includes Crosby, Stills, Nash & Young; Queens of the Stone Age, My Morning Jacket, Tom Waits (Sunday only), Elvis Costello, Diana Krall, fun, Heart and Jenny Lewis. Tickets are available at Live Nation.